Thankfully, God spoke through me as I shared our incredible love story as well as the shock that stopped my world from spinning. I explained my process of healing (The Pearl for those of you who know and are praying!). I mentioned that we all have some pocket of pain in our lives but we can either allow it to kill us or we can trust God to make a pearl out of it. I desired to be accessible and told the students I would pray with whoever needed/wanted it. I was blown away as a dozen girls asked me to mentor them, to help walk them through their own pain. With tears in their eyes as well as mine, I held girls in my arms- finally I am seeing the bigger picture. Yesterday I spoke with 60 students… On Friday, I will be in front of nearly 500 teenage girls sharing my very raw testimony again. In speaking yesterday of the man I loved with my whole being, I felt a twinge of guilt; like I should not be talking about him in this way. Having no closure, zero understanding and 500 questions I would love for him to answer; talking about him is very difficult. It is almost as if the man I would have given my life for died in a car wreck and some stranger took his place. The man I knew, I loved more than words could express. The person who stands in his place is someone I don't know. In December of last year, he and I exchanged our wedding vows with each other. We desired to write our own and with the help of a pastor, combine them into what we would pledge on our wedding day. 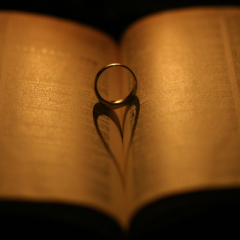 I spent months pouring over my vows, writing, rewriting and praying. I read them to him with tears streaming down my face and my heart moved with more love than I knew I was able to contain. He then read me his. I cherished each and every word. He promised to love and care for me all of the days of my life as he was certain that God had anointed the two of us to be an example of the Lord’s picture of marriage. Daily I prayed over our vows as both of them hung from my bathroom mirror. I meant the words that I wrote… unfortunately he did not. I took the exchanging of vows very seriously. A promise is a promise and although they had not yet been exchanged at the altar; it was a binding commitment in my eyes (as was the engagement ring a year earlier). I have still felt bound by my vows to him. A friend suggested that I write new vows to take their place; vows to my Heavenly Bridegroom; vows to serve as a foundation for the ministry God has given me. I have stepped across the line. I am going God’s way and am not turning around or looking back anymore. I will use my life as well as my pain to celebrate the goodness of the Lord, the faithfulness of His character, the redemption of His love and the wholeness of His family. I will communicate His Word boldly and without restraint. My eternal reward is in Heaven; I refuse to waste another breath on shallow living, trivial talking, petty thinking or faithless worry. I desire that my life minimize me and magnify God. I will continue to grow in maturity, remain consistent in ministry and fulfill my purpose as a Warrior in Christ’s Army. This life is fleeting and merely a preparation for the next. I will give it all I have without holding back; exchanging “me” for “we,” wealth for worship, comfort for character, status for service, possessions for people and glory for grace. I will do the best that I can for Christ with what I have each and every day. I will not become captivated by culture or motivated by praise; frustrated by problems or intimidated by the devil. I will focus on the race straight ahead and not become distracted by the sidelines or those running beside, in front of or behind me. My eyes are locked on the finish line. When times get tough, I will kick it in to overdrive and keep moving forward by God’s grace and His strength within me. I am purpose-driven, spirit-led, and mission-focused. I will not be bought or swayed. I will not quit. My answer in advance is YES to anything and everything you ask me to do, Lord. Wherever you lead and whatever the cost, I am ready to make the sacrifice. I trust the Lord to restore to me ten-fold what was lost.